For the Shrine Path in Evanescent Existence, see Shrine Road (outside). The Shrine Road (参道, Sandō) starts from the Senri Shrine and stretches on through the Sanctuary, whether it ever leaves the Sanctuary is unclear as it was never revealed where the road leads to. Because not many people visit the shrine anymore, it goes more or less unused. 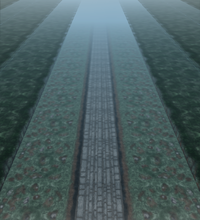 The Shrine Road is the setting for various stages in all the Len'en Project games. It is a long shrine road that stretches out from the Senri Shrine. It is a long footpath with trees following it on both sides. There is a path that leads to the Human Village from the Shrine Road, simply called "Path from the Shrine Road to the Human Village". It's presumed that the Unlost Woods and the Frontline River is located not far from the road. During the incident of Earthen Miraculous Sword, Jun Amanomiya appears to be selling umbrellas on the Shrine Road, taking advantage of the cloudy weather. The protagonist assumes that they are the cause of the incident and defeats them. In the extra stage, the cloudy weather has returned and snow has blanketed the road. While on the way to the shrine, each of the protagonists is ambushed by Adagumo no Saragimaru, who is seeking to kill them and avenge Yaorochi's failure. However, Saragimaru is defeated, and the protagonists invite them to the shrine to drink. In stage 1 of Reactivate Majestical Imperial, Sese Kitsugai seems to be wandering around on the Shrine Road. The protagonists beat them up just because they happened to be there. The protagonists wander around the Shrine Road, trying to see if they can find any leads about the cloudy weather. They run into all sorts of people that they have fought before, such as Sese Kitsugai and Aoji Shitodo. Stage 1 of the game is defaulted to be located at the Shrine Road, and you will stay on the road in the later stages if you were to always take the Neutral (middle) route of the game. However, you can pick different routes to new locations for later stages. As such, if you go left onto the haze route, you'll go to the Unlost Woods on the next stage, but if you go right onto the Brilliant route, you'll go to the Frontline River. This page was last edited on 14 November 2018, at 12:41.